I’ve often found that the best activities start with me dumpster diving. Not so much dumpster diving so much as recycle bin diving. 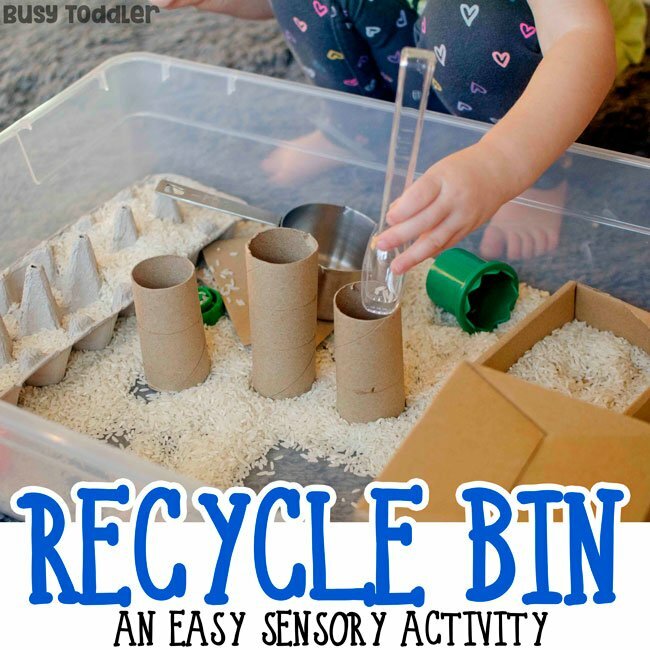 Trash is awesome for toddlers to play with (I’ll explain – I promise) so this recycled sensory bin was bound to happen at some point. Today was that day. I’m not gonna lie – I think I might be a little bit addicted to dumpster diving / recycling bin type activities. I mean, we’ve built with trash…we’ve painted trash…we’ve made puzzles with trash…and today, we’re going to play with trash. 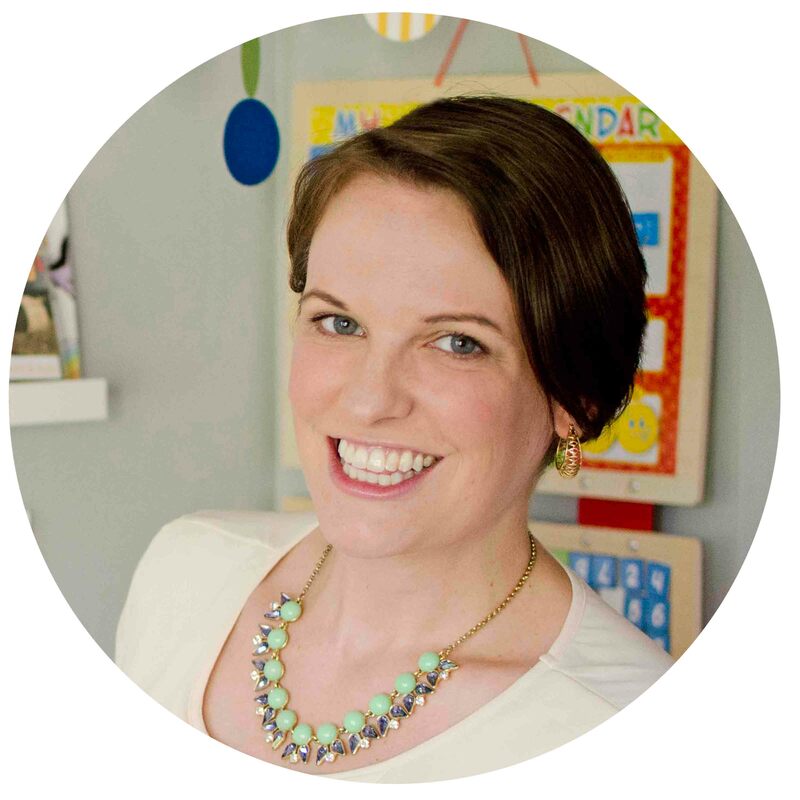 One Mom’s junk is another Mom’s toddler activity. 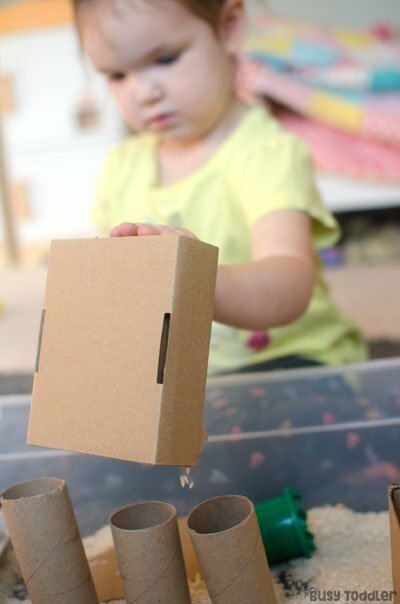 Sensory bins are the bestest for toddlers! 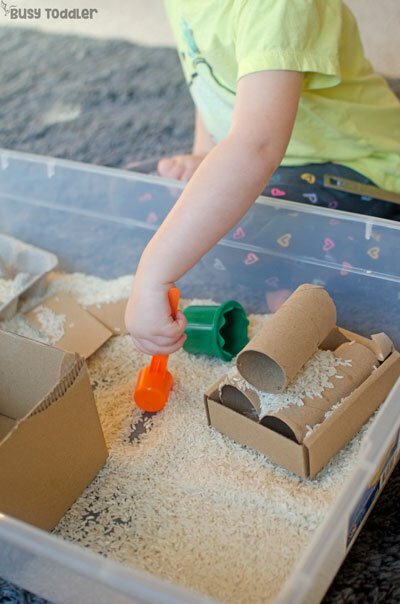 There’s nothing like a sensory bin for toddlers – they learn so much playing in these. I know the mess can be scary (it doesn’t have to be!) 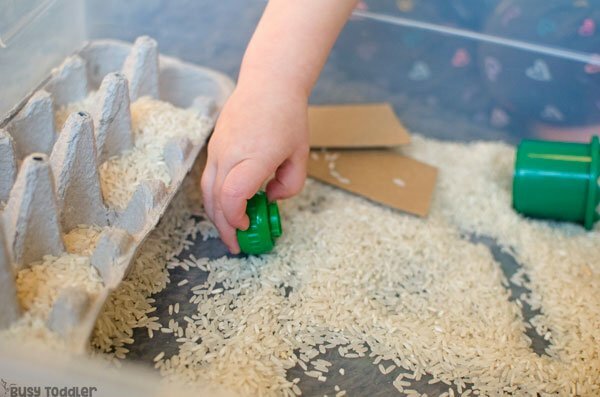 but once you get the sensory bin basics down – it really is smooth sailing. 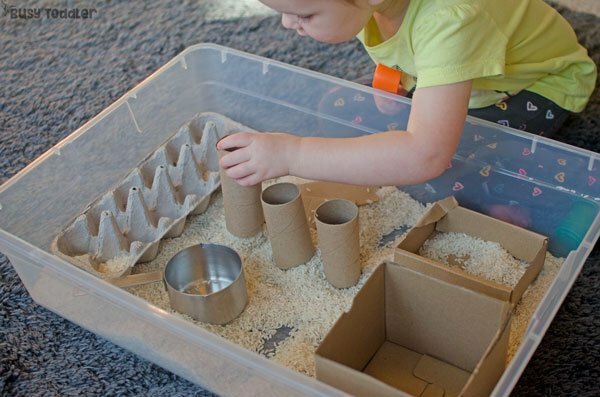 Toddlers learn amazing skills from sensory bins. They learn about scooping and pouring, they learn about capacity, cause and effect, spatial awareness, fine motor skills…oh my goodness, the list goes on and on! All from an easy little set up of rice and some extra items. 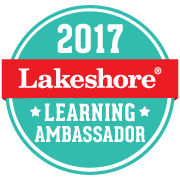 The fancy term for an activity like this – one that uses random items instead of typical ones – is “non-standard”. So for this sensory bin, I selected a bunch of “non-standard” items from our recycling bin. Non-standard items invite so much extra imagination and thinking to come to life. I was looking for special items. I took the items I’d triumphantly recovered from my dumpster dive and added them to a simple rice sensory bin. I threw in some measuring cups and tongs for good…well, measure. This gave my daughter (2.5) something to use for scooping and pouring her rice. 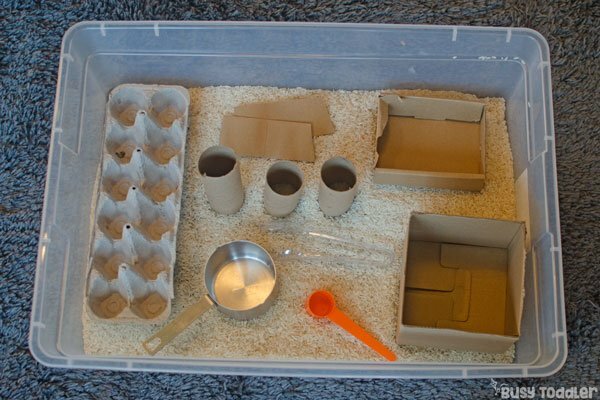 There isn’t much I need to do with a sensory bin like this. I “fix it and forget it” (expect I’m always supervising, duh) but this is for my daughter so I take a few good steps back. It’s up to her how she plays with it and what her games are within the tub. She spent a lot of time with this bin filling the tubes – she said they were tall cakes. Don’t you just love a toddler’s imagination? 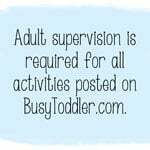 Remember that sensory bin etiquette takes time. If your toddler is throwing rice from the bin today, that doesn’t mean they will always throw rice. It’s kind of like learning to eat at the table: one day, you’re scraping spaghetti from the ceiling and the next day, you realize they barely needed a wipe after dinner. Think about putting a towel down to collect messes and consider putting the bin on a hard surface. I know I did this on carpet with nothing underneath but trust me – my daughter is a pro and this didn’t happen overnight. Get your dumpster dive on! 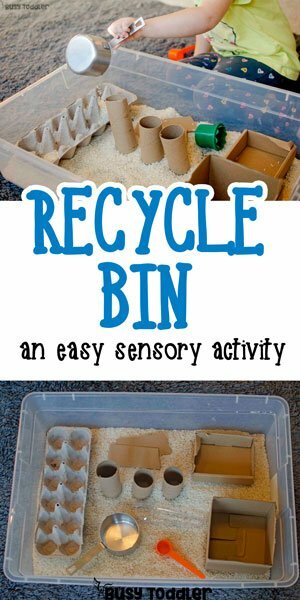 This recycled sensory bin ended up being a fabulous activity and one that we will definitely do again. The great part about using these “non-standard” items is that they are always changing. You never know what the recycling bin will hold or what treasures you will find. 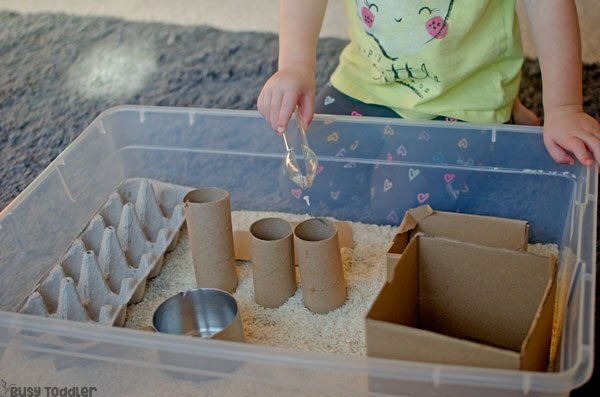 Will you build a recycled sensory bin with your toddler?